Our professional course offerings revolve around our two below series. 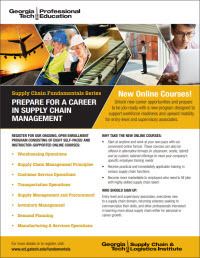 Our traditional professional education certificate programs and short courses are typically designed for mid-career supply chain professionals. Participants' titles that enroll in the courses range from senior analyst through director. The included courses typically range from two to four-days and have an in-depth approach to a specific topic or theme. 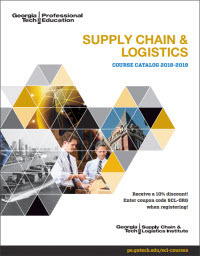 Course content typically focuses on management decision-making techniques, analytical techniques, and domain-specific topics appropriate for management. Knowledge transfer takes place through a number of mechanisms including case studies, group projects, computer simulations, field trips, and lectures. The public course schedule is generally open-enrollment, so all are invited to participate. Students come from all industry segments and from six continents. Open enrollment courses typically take place on Georgia Tech campus’ in Atlanta, Savannah, and Panama City, Panama. All public course schedule courses are also available as custom courses for companies wanting to have tailored, private programs (or hybrid courses that are tailored to an anchor company and then also opened up to a wider audience). The custom courses can be offered nearly anywhere with proper facilities. The program currently consists of seven different series/certificate programs comprised of 28 courses grouped into specific subject areas. A large percentage of students seek certificate completion; however, students are not required to enroll in entire certificate programs. All courses provide continuing education units (CEU’s), certificates, and formal registry in the Georgia Tech student records system.